FF-IPS0102G is a plug-and-play unmanaged industrial PoE switch. 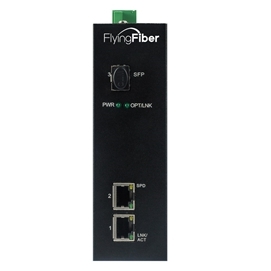 This switch provides 2 10/100/1000Base-TX Ethernet port and 1 1000Base-X SFP slot, the Ethernet port support Power-over-Ethernet (PoE) function. The switches are classified as power source equipment (PSE), and when used in this way, the switches enable centralization of the power supply, providing up to 30 watts of power per port and reducing the effort needed for installing power. The switches can be used to power IEEE802.3af/at standard devices (PD), eliminating the need for additional wiring. FF-IPS0102G support CE, FCC, RoHS standard, adopt industry standard design, IP40 protection, rugged high-strength metal case, power input (48-58VDC). The switch support IEEE802.3, IEEE802.3u, IEEE802.3x with 10/100/1000Base-TX, full/half-duplex, and MDI/MDI-X auto-adaptation, the -40-85℃ operating temperature, can meet all kinds of industrial environment requirement, providing reliable and economic solution for your industrial Ethernet network. 1). Support 2 10/100/1000Base-TX PoE port and 1 1000Base-X SFP slot. 2). Support IEEE802.3, IEEE802.3u, IEEE802.3x, IEEE802.3af/at. 3). IEEE802.3af, maximum 15.4W power supply. 4). IEEE802.3at, maximum 30W power supply. 5). Industrial chip design, 15kV ESD protection, 8kV surge protection. 6). 48-58VDC redundancy power, reverse polarity protection. 7). Industrial grade 4 design, -40-85°C operating temperature. 8). 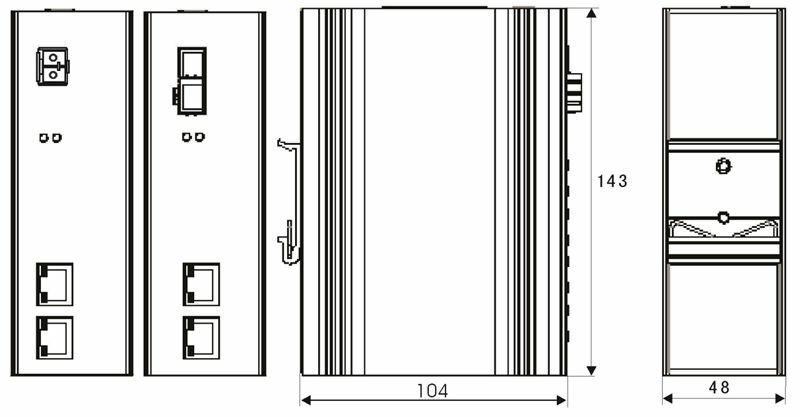 IP40 rated aluminum alloy housing, DIN-Rail mounted. Pin-out: 1/2(+), 3/6(-), IEEE802.3af max 15.4W, IEEE802.3at max 30W. Fiber Connector: SC/ST/FC/LC(SFP Slot), Single Mode/Multimode, Dual Fiber/Single Fiber, 2Km/20Km/40Km/60Km/80Km/100Km/120Km is Optional. Power Supply: 48VDC DIN-Rail Power Supply or Power Adapter is Optional.